Vancouver punk band The Rebel Spell are touring across Canada this fall to promote their new record, Last Run. Released in late September, Last Run showcases the band’s song-writing skills and passion for social justice. What is most interesting for ActiveHistory.ca readers, however, is the fact that The Rebel Spell have included a song on their album about a historical event: the little-known Tsilhqot’in War in the colony of British Columbia in 1864. The song “The Tsilhqot’in War” commemorates the 150th anniversary of a significant moment in Canada’s colonial history that does not generally receive a lot of popular attention (see the Further Reading section below for some notable exceptions). The Tsilhqot’in War was a conflict between Indigenous peoples of the Tsilhqot’in Nation in the interior plateau of the colony of British Columbia and a crew of construction workers building a road from Bute Inlet to the goldfields in the Cariboo. In the early 1860s, politician Alfred Waddington sponsored the building of an alternative route to the Cariboo goldfields to compete with the established Fraser Canyon road. Construction on the alternative route began in 1862 without proper consultation of the Indigenous peoples whose territories the road would travel. In that same year, a devastating smallpox epidemic, introduced by settlers, spread throughout the Pacific Northwest killing many Tsilhqot’in peoples. 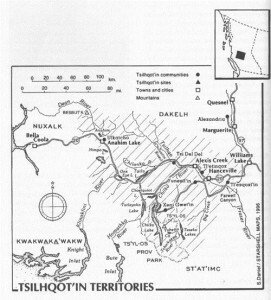 Stuart Daniel, “Tsilhqot’in Territories,” A Traveller’s Guide to Aboriginal B.C. Cheryl Coull (Vancouver: Whitecap, 1996), 148. In the spring of 1864, as part of a strategy to stop the road’s construction and prevent further colonial encroachment on unceded lands, Tsilhqot’in members, led by Klatsassin, killed nineteen men. Fearing an organized Indigenous uprising, the colonial government of British Columbia used deceit to douse the flames of discontent: the state lured the Tsilhqot’in warriors to peace talks with promises of immunity only to arrest them, charge them with murder, and hang them as a show of force. In their defense, Klatsassin’s last words were “We Meant War Not Murder.” In part because of these events, the Bute Inlet road was abandoned and the Tsilhqot’in somewhat successfully resisted colonial intrusion for almost another one hundred years. In 1993, British Columbia’s Attorney General officially apologized for the hanging of Klatsassin and his fellow Tsilhqot’in warriors and the provincial government provided funding to locate their graves as a form of redress. The Rebel Spell’s “The Tsilhqot’in War” offers an interpretation of this important conflict from an anti-colonial perspective and thus contributes to a greater understanding of Canada’s colonial past. The song does not get all the facts right, but by highlighting Tsilhqot’in agency in the face of disease and settlers’ attempted dispossession of Indigenous lands, The Rebel Spell successfully challenge Canada’s “myth of benevolence” which suggests colonialism was an entirely peaceful process. Such a song is especially timely given the Supreme Court of Canada’s unanimous decision early this summer to affirm Tsilhqot’in land title in British Columbia. The Rebel Spell’s song supplements recent efforts—such as the “We Do Not Know his Name: Klatsassin and the Chilcotin War” section of Great Unsolved Mysteries in Canadian Historyand John Sutton Lutz’s excellent chapter on the Tsilhqot’in in his book Makúk—to shed new light on the Tsilhqot’in War and to showcase Indigenous peoples’ historical struggles for land and self-determination in what is now known as British Columbia. The Rebel Spell’s punk rock history lesson is yet another positive sign of the growing interest in popular culture to focus on Canada’s colonial past and Indigenous peoples’ present struggles. You can buy The Rebel Spell’s new record from their website and you can also listen to “The Tsilhqot’in War” and read the lyrics online for free. Sean Carleton (@SeanCarleton) is an activist and educator living in Nogojiwanong (Peterborough), Ontario, Anishinaabe Territory. He is a PhD Candidate in the Frost Centre for Canadian Studies and Indigenous Studies at Trent University and he studies the history of colonialism, capitalism, and education in Canada. Furniss, Elizabeth. The Burden of History: Colonialism and the Frontier Myth in a Rural Canadian Community. Vancouver: University of British Columbia Press. 1999. Gough, Berry M. Gunboat Frontier: British Maritime Authority and Northwest Coast Indians, 1846-1890. Vancouver: University of British Columbia. 1984. Lutz, John Sutton. “The Tsilhqot’in.” Makúk: A New History of Aboriginal-White Relations. Vancouver: University of British Columbia Press. 2008. Van Rijn, Kiran. “‘Lo! the Poor Indian!’ Colonial Responses to the 1862-63 Smallpox Epidemix in British Columbia and Vancouver Island.” Canadian Bulletin of Medical History/Bulletin canadien d’histoire de la médecine. 23.3 (2006): 541-560. 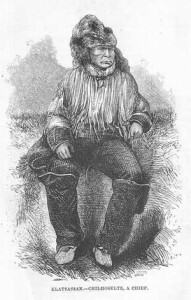 “We Do Not Know His Name: Klatsassin and the Chilcotin War.” canadianmysteries.ca. http://canadianmysteries.ca/sites/klatsassin/home/indexen.html. Great post! I should add that The Rebel Spell’s previous album also contains the song “The World Turned Upside Down,” a cover version of Leon Rosselson’s song about the Diggers. Again, great post. Seeing something about punk on active history warmed up my heart.